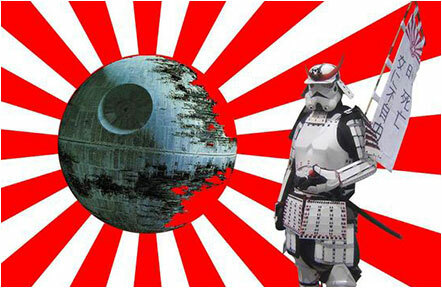 While it’s pretty much accepted that Star Wars is a worldwide phenomenon, apparently it’s particularly big in Japan. So much so that in order to satisfy the huge demand for Star Wars toys, local Japanese toy companies like SH Figuarts & Mafex have also been manufacturing officially licensed 6” Star Wars action figures. And the difference in quality of these Japanese figures are a galaxy far far away from their US Hasbro counterparts. Now while the superior quality of these means a higher price point, there is another option out there for the more adventurous collector that isn’t as expensive but just as amazing in quality. 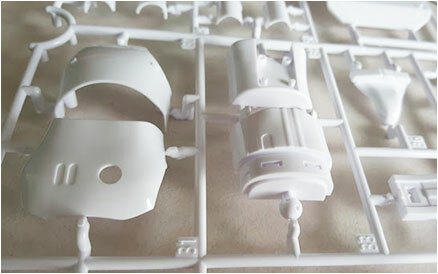 In Japan, another big thing is Gunpla, which is model building of Gundam robots. 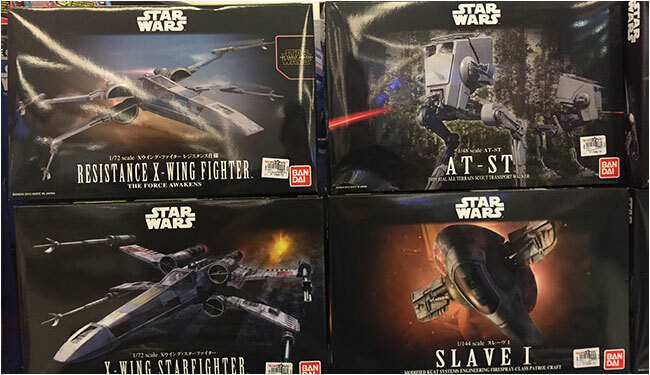 In what I imagine was a bid to attract the Gunpla/model building enthusiast, toy company Bandai produced a line of Star Wars model kits. 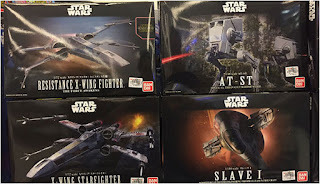 While the majority of the kits are builds of iconic Star Wars ships and vehicles, they have also ventured into producing 6” character kits as well. Now I am by no means a model builder, the intricate skill and patience needed to build a model, plus the static and more often than not fragile end product is something I never found appealing…ever. But ever since I learned about them, these Star Wars character model kits have always intrigued me. I decided to bite the bullet when I was in Japan last year and get myself a First Order Stormtrooper. 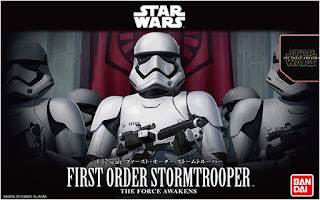 The First Order Stormtrooper was one of the first Force Awakens Black Series figures I bought before the movie came in 2015. After seeing the movie I began regretting my purchase as what I got was the basic trooper that lacked the riot gear featured in the movie. In case you snoozed through the Battle of Takodana, there was a specific trooper who called out Finn accusing him of being a traitor. Instead of shooting Finn though, the trooper dropped his blaster and activated his Z6 Riot Control baton and rushed toward him, opting for close quarters combat. He actually manages to best Finn who is armed with a lightsaber and would’ve killed him if he didn’t end up getting blasted himself by Han Solo (yes once again…Han DID shoot first!). Anyway, it was later explained that this Stormtrooper had a more specific reason for calling out Finn and attacking him at close range. 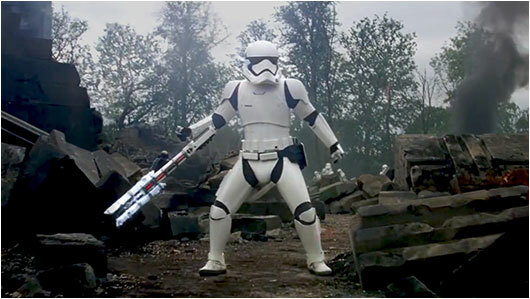 Turns out that this Trooper, code named FN-2199 or “Nines” was Finn’s former squad mate, so he took his defection to the Resistance a little more personally. Anyway, all this made me want to get my own FN-2199 for my collection. 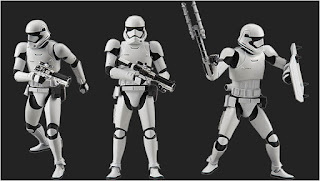 Hasbro did re-release the First Order Trooper with riot gear, but it was part of a two pack with another Poe Dameron that I didn’t care for, plus the Z6 Riot Control Baton was molded as a single piece and couldn’t be “activated”, making this a no go for me. 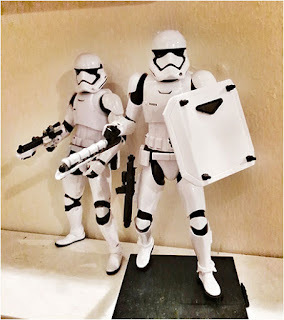 So instead I opted to give the model kit a try since I figured the “building experience” would justify the double trooper purchase and of course, this version did come with an articulated riot baton. It also didn’t hurt that he cost even less than your typical Black series figure. So once I had the time, I began the build. Admittedly, it was quite intimidating opening the box and seeing all those model kit sprue trees and Japanese instructions, but I just dove into it. Luckily despite being in another language, the instructions were very detailed and easy to visually understand and even if it was a slow and meticulous build, it wasn’t too complicated and quite fun since everything was snap on and didn’t require any glue at all. Building the model also gave me greater appreciation of what goes into building an action figure. Yup, I was quite impressed to find that the end result wasn’t some fragile model but a fully poseable and durable action figure, even more articulated than a Black series figure. Granted, it felt a lot lighter in hand than your typical action figure due to the hollow parts; it is built and designed well and will not fall apart on you. I loved the building experience and end result so much that I knew that I had to get more. First two on my list were an updated Captain Phasma and C3-PO. Now I know what you’re thinking, my Black series Captain Phasma was one of the most coveted finds in last year’s Force Friday hunt. How could I even think of replacing her? Well what can I say? 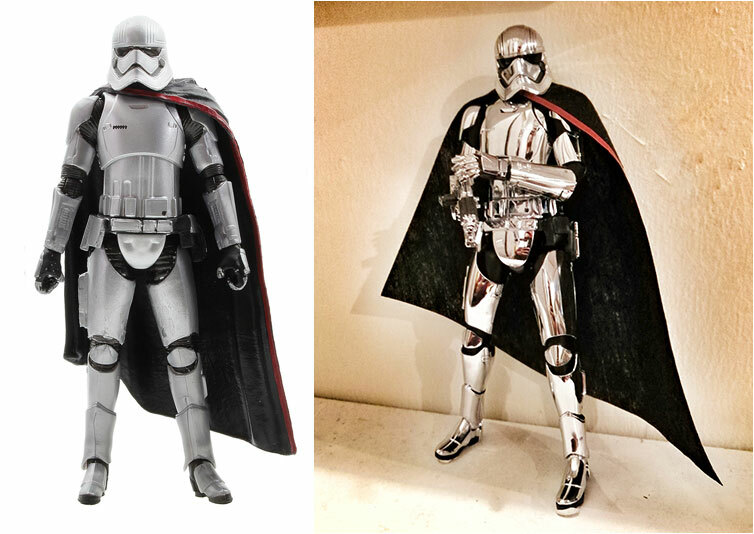 The model kit Phasma was just…shinier which to me was more screen accurate and despite being tall and imposing still looked feminine. Comparing the two, the Black series Phasma just looked too clunky and man-ish. 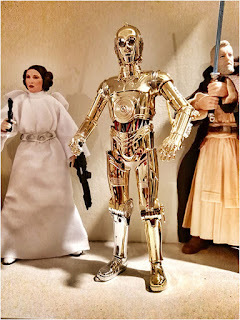 Same goes with C3-PO. The model kit is shinier and more screen accurate compared to my former Revoltech version. Of course having the model kit C3-PO meant I needed a matching R2-D2 to go with him. Luckily Bandai released a R2-D2/BB-8 two pack which also presented to me another building challenge. 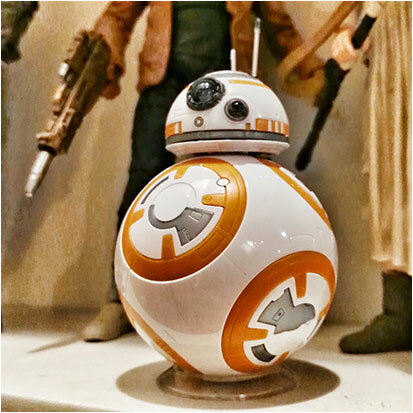 The end result was definitely a better BB-8 than the Black series version that came packed in with Rey even sporting a convenient transparent mount so you don’t have to worry about him rolling off the shelf. Unfortunately, despite being a fun build as well, the R2-D2 ended up looking a little inferior to my Revoltech version. I think the size is more accurate and I do appreciate the third leg that actually stores in his body (the Revoltech version sports a separate piece that you plug in) as well as the optional arms and accessories it comes with, but his silver parts are molded in a dull grey which I think ruins it….and painting them requires more effort than I care for…so at least for this, my original Revoltech R2 wins out. It doesn’t stop there though….with my building juices flowing, I got myself another Clone trooper and a Sandtrooper. I figured since the Black series Clone Trooper I had was a Mark 1 version, it made sense for me to have a Mark 2 version for the shelf as well (the kit gave you the option to build either version). 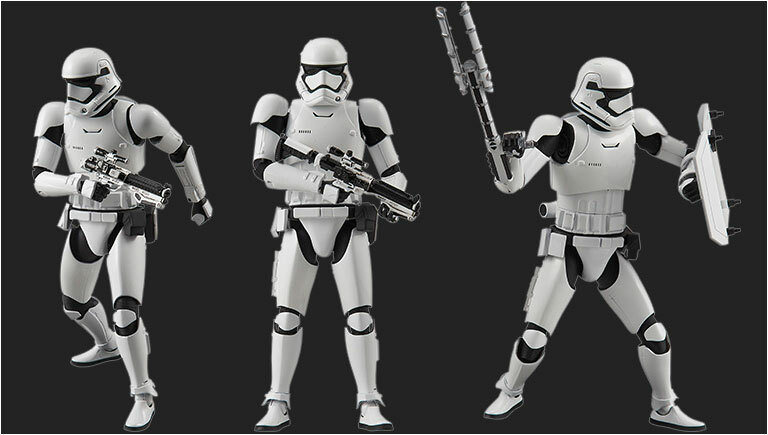 And since I skipped out on the original Black series Sandtrooper, I figured this model kit would make sense. The added gear differentiated him enough from the basic Stormtrooper that I had. 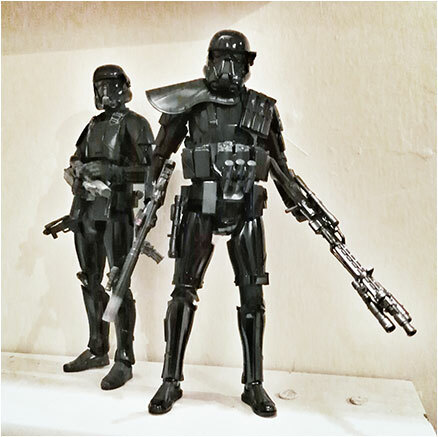 Finally, I got myself a Rogue One Death Trooper. Despite it looking too lanky for my taste, I did get the Black Series Version. However, the Bandai version gives you two build options: the first being the basic Death Trooper, which is what Hasbro initially released, and the second the more decked out “specialist” Death Trooper. So ultimately the second build option justified this purchase for me. What can I say? I’m definitely addicted to this stuff. I couldn’t recommend these kits enough! Like I said, the building experience is quite fun and the end result is a perfect action figure with better articulation and more accessories for multiple display options than a typical Black series figure. And if that weren’t enough, more often than not, their price is comparable or even better. While the Death Trooper was my latest purchase, I’m pretty sure it won’t be the last.